How was your Easter holidays? I hope you had a lovely time with your closest family or friends. 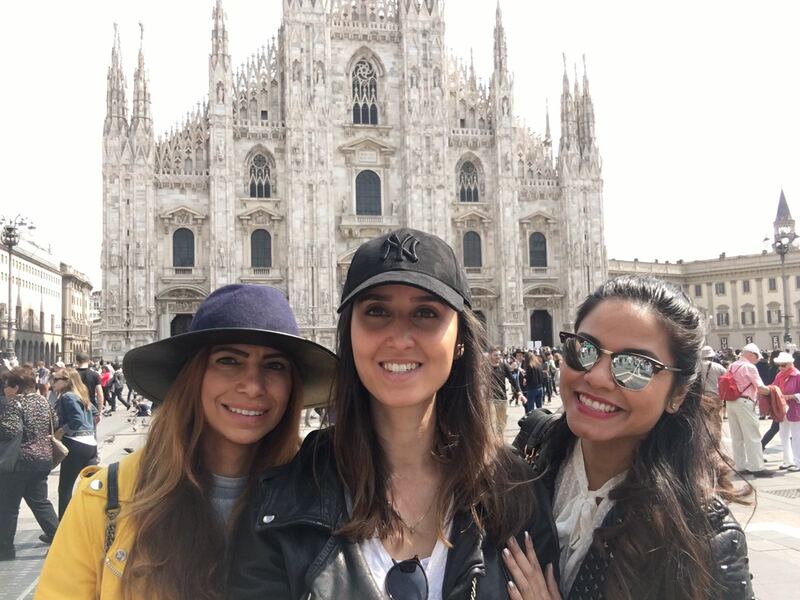 Before Easter I met up with two of my girlfriends in Milan for a journey to Italy’s most famous cities. We travelled from Milan to Genoa, Cinque Terre, La Spezia, Pisa, Florence, Venice and returned to Milan again. Before booking our flight we did an extensive research for best airline tickets and hotel accommodations. Since we’re living in different countries (Germany and the Netherlands) we needed to make sure that our travel itineraries correlated. In the past we have already travelled together to other European countries such as Dublin (Ireland) and Palma de Mallorca (Spain, please check out the blog post). We were going to rent a car, but afterwards decided that public transportation is just way more convenient and less stressful. Our journey began in the Fashion Capital of Italy on the 14th of April, but our first stop was the Cathedral “Il Duomo.” Since we were travelling freestyle, we didn’t book our visit in advance. So we had to stand a good half hour in the queue before being told that we could purchase our ticket “online” in order to skip the long queues at the ticket office. After doing this we quickly picked up our tickets at the office and made our way to the entrance. After the Doumo we walked the shopping area and the famous Galleria Victoria Emanuelle II to do some window shopping! Hahaha.. we still cannot afford these luxuries, but hey a girl gotta dream big right? Then we made our way to the Scala Theatre and observed it from outside. In the afternoon we made our way to my all-time favourite district called Navigli for an authentic Italian ice cream. After that we just hangout over there for some drinks. There’s so many hip chill-out places there! My friend looking fab at Galleria Victoria Emanuelle II. Having a gelato at the Navigli District. This was my first time in this coastal maritime area and was truly surprised by the contrast between the medieval and the new town. Even though we were there on Easter Sunday we were able to explore the old port “Porto Vecchio,” the streets where the noblemen used to live, Piazza de Ferrari, Piazza della Vittoria and the house where Christopher Columbus grew up as an infant (he was born in Genoa!). At the city port of Genoa. The port of Genoa with a mixture of different architectural designs. The main square of Genoa, Piazza de Ferrari. Loved walking through the alleyways! 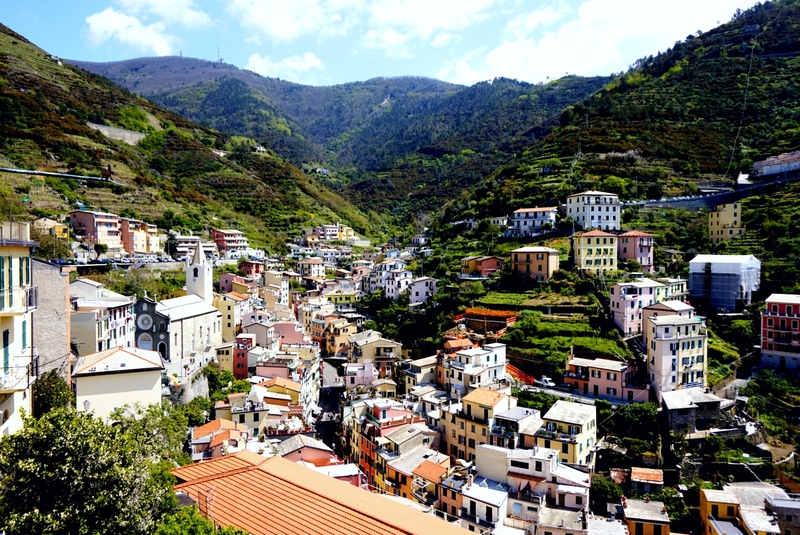 Cinque Terre has been long on my list of places to visit, being a touristy destination we avoided staying in the “Land of the 5” coastal towns and booked our hotel in La Spezia. 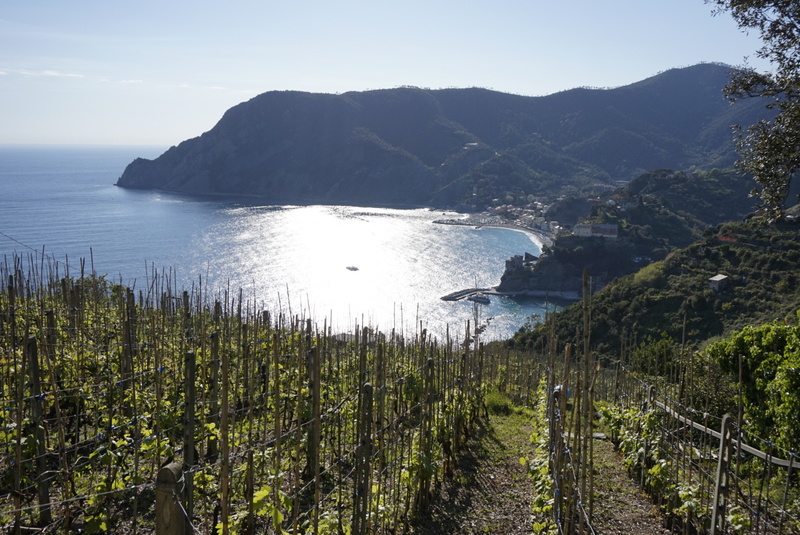 Our first stop was Monterosso, which we have lingered a full hour before heading to Vernazza on foot. We must of walked about 3 hours, because we stopped way to many times to enjoy the views and to take photos. When we reached Vernazza we were in awe by the tiny fishermen village with colourful houses. After having a quick bite to eat we headed back to our hotel. Monterosso from afar, where our hiking trip began. The three Musketeers heading towards Vernazza. Vernazza felt like a village from a fairy tale! The next day we had to say goodbye to one of our friends as she needed to head back to the Netherlands. She travelled to Pisa for her flight and luckily she had some time to admire the Leaning Tower. My other friend and I decided to stop by another town called Riomaggiore in Cinque Terre before heading to Pisa. The weather was so good.. we didn’t want to leave! Riomaggiore between the mountains and close to the seaside. Suggestion: if you wish to visit the Natural Park by walking the routes between the towns, then I suggest you buy the Cinque Terre card for €16 (includes some perks like using the WiFi and taking the ecological busses). It’s advisable to start your journey early in the morning (Spring time is usually quite chilly in the morning). If possible stay longer to enjoy the landscapes! Our train journey between La Spezia and Pisa took around an hour. 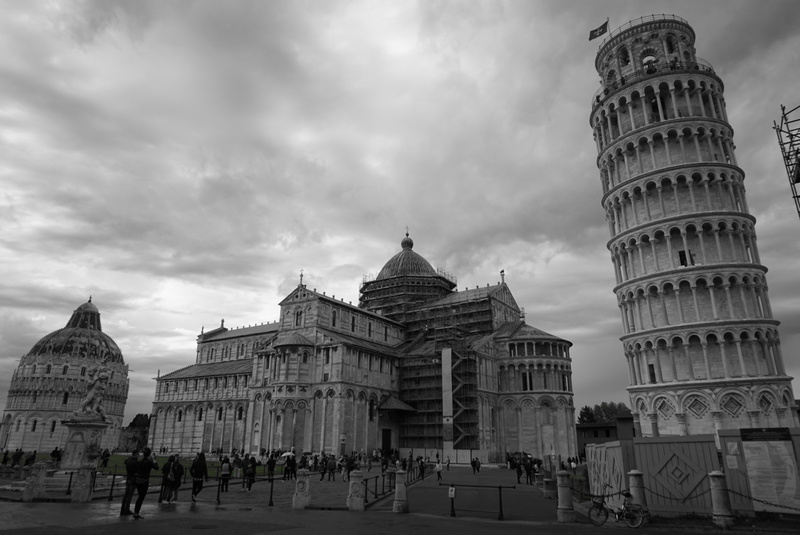 After dropping our baggage at the hotel, we went to the Leaning Tower of Pisa and the Piazza dei Miracoli. It was a bit rainy, so we didn’t stay too long. Honestly, you can just spend a few hours in Pisa. It’s possible to go on the tower for about €18 on their official site, but it’s up to you. For us, just admiring the tower from a distance was sufficient. Especially seeing tourists making their best possible poses. The Leaning Tower of Pisa. 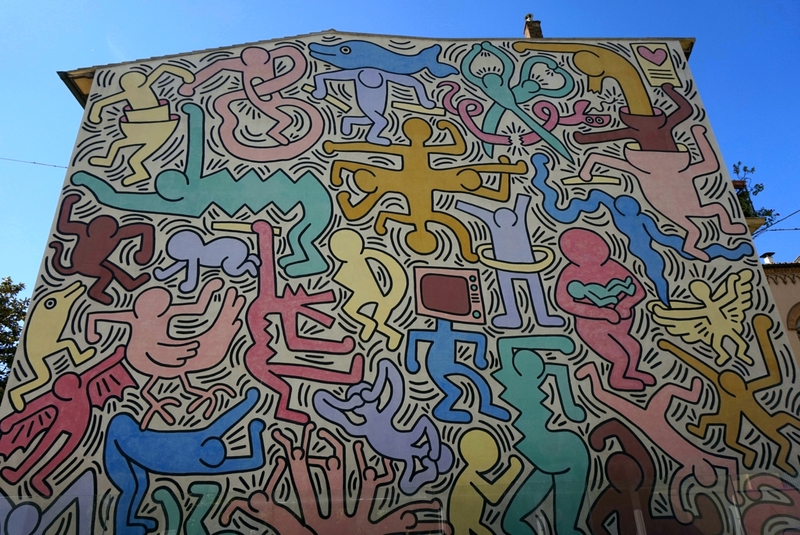 After checking out of our hotel the following day, we visited the mural (on the side of St. Antonio Convent) by Keith Haring called Tuttomundo (painted in 1989) near the train station at the Piazza Vittorio Emanuele. Tuttomundo by Keith Haring depicts joy, peace and actually also some darkness. Our next journey to Florence took less than an hour. Ahhh Florence! The first time I came to this great city, I felt as if I went back in the time of the High Renaissance, the genius Leonardo Da Vinci and the Medici family (hehe.. I was a fan of the series Da Vinci’s Demons!). Thanks to the Medici family a lot of well-known works from artists such as Michelangelo and Botticelli were financed. Even though the streets of Florence is filled with sculptures (replicas), we couldn’t leave without seeing the symbol of Florence, which is Michelangelo’s David at the Galleria dell’Academia. Other places we went to were the Florence Cathedral (outside), Florence Baptistery (outside), Ponte Vecchio, Piazza della Signoria and Piazzale Michelangelo (for the best panoramic view!). If you’re ever planning a visit to this marvellous city then be sure to also check out Uffizi Gallery (Renaissance masterpieces, book a month in advance! ), the Basilica di Santa Croce (Basilica of the Holy Cross) where you can find the tombs of Michelangelo and Galileo. From Florence to Venice we sat about 2 hours in the train, after arriving there we bought a 3-day Transportation card (costs €28, if you’re under 29). We needed this card as our hotel was on the Venetian island of Lido, just 15 minutes from the Piazza San Marco by water bus. On our first night we just chilled on Lido and watched the most amazing sunset. 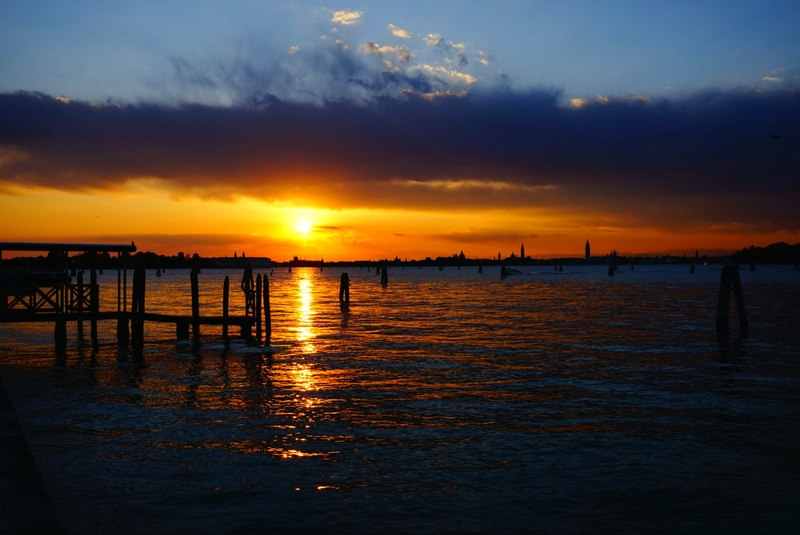 Ending our day on a peaceful note at Venice Lido. The following day we visited Murano, which is well-known island where special “Murano” colourful and fancy glass pieces are made. We even had a glimpse in one of the factories and there were plenty of shops selling extraordinary works. After that we hopped to another island called Burano. This island had many houses in rainbow colours, just so pretty to photograph! We even bought a whole package of their special butter cookies called the Bussolai Buranei, which happens to be an Easter delicacy in Venice. 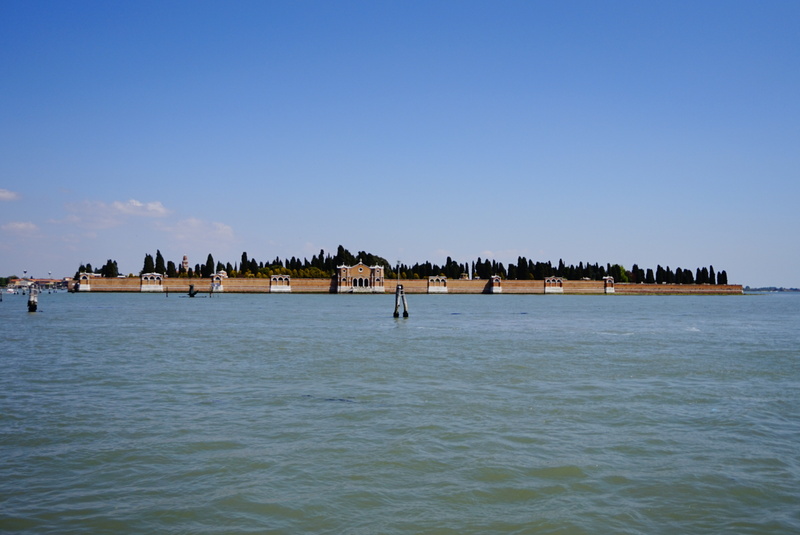 The Cimitero di San Michele (cemetery island of San Michele). 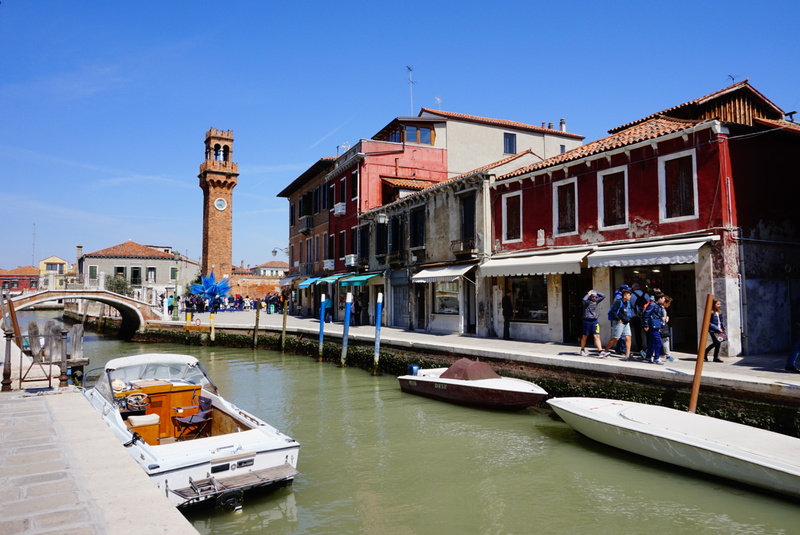 At Murano, in the far back you can see the Torre dell’Orologio (clock tower) and the Cometa di Vetro (glass comet). 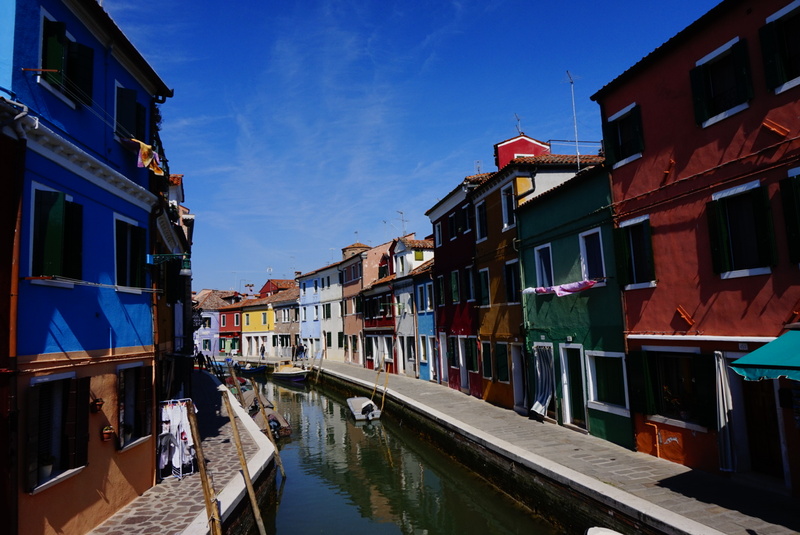 Some colourful houses in Burano. At the Piazza Baldassarre Galuppi, Burano. 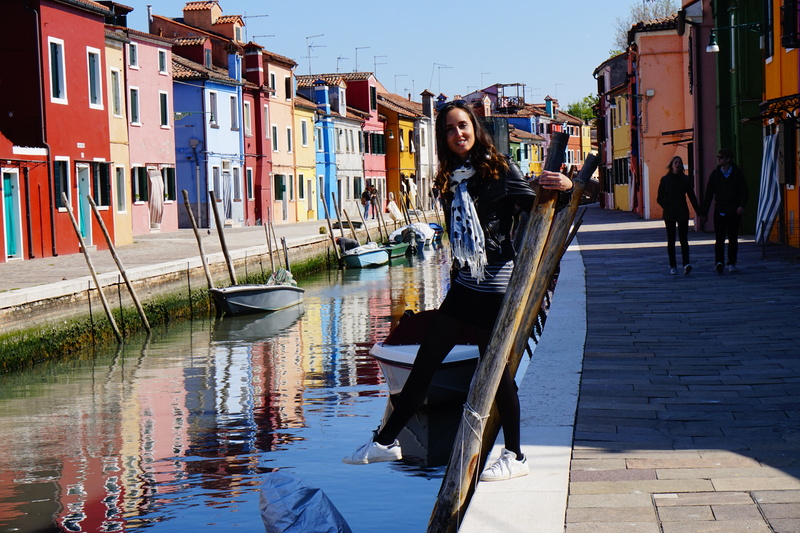 My beautiful friend at Fondamenta Cao di Rio a Sinistra, Burano. 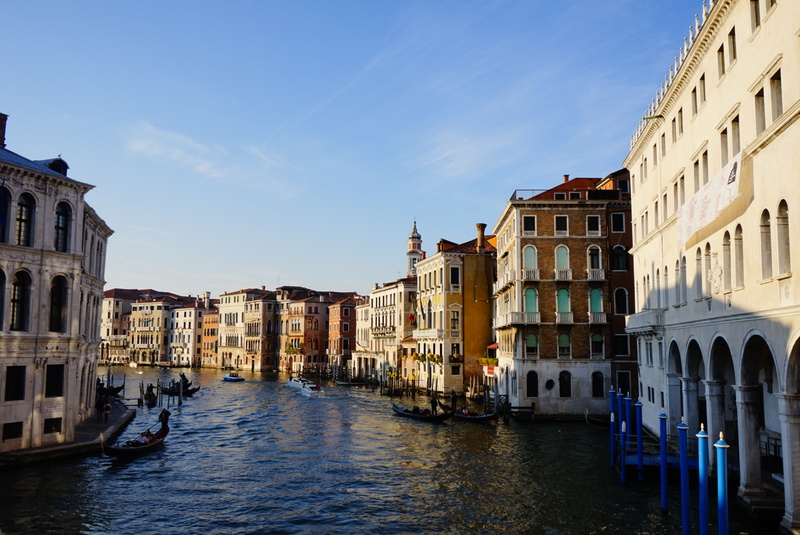 After exploring Burano, we finally headed to Venice’s highlights such as the Piazza San Marco, the Rialto Bridge and wandered near the romantic canals of Venice. On our last day in Venice we took the water bus from Lido to the Venice train station (Venezia S. Luccia), which took an hour. Nevertheless it was a dreamy voyage passing through the landmarks and watching the gondoliers! We took a 3-hour train journey to Milan, because it was the most economical (there was also a 2-hour option). After we made it to our hotel, we were exhausted and hungry. So we went to a sushi restaurant.. For our final night we wanted to go for a different cuisine. No offence though to the exquisite Italian dishes. Travelling with friends is always a great option! Since I’ve known these ladies for a long time, we’re like travel buddies and we enjoy exploring new places together. Moreover, Italy for me is a country filled with hidden treasures worth seeking. 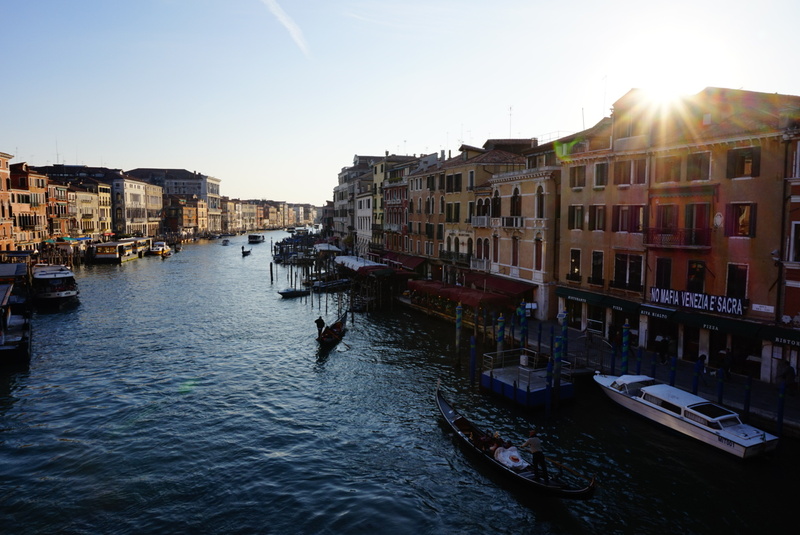 Northern Italy is in my opinion a good option to visit if you haven’t visited Italy before. Especially the food is so fresh and tasty.. you can’t miss out. From our experience we asked the locals where to eat and tried to avoid the busy touristic areas. For my next Italian adventure I will consider visiting the South and the Adriatic coast (e.g. Amalfi, Positano and Sicilian towns). Every corner was picturesque and it was without a doubt worth the visit. Really glad to have shared this with you! I hope I’ve inspired you to visit some of these places. Have you ever been to Italy? Which Italian city or town did you like or would like to visit? That’s it for now.. Have a nice beginning of May! P.S: This week going to Berlin for the first time!